Angiogenesis, the formation of new blood vessels, is essential for tumor growth. A new study reported in The American Journal of Pathology describes a vascular stabilization biomarker that can visualize blood vessel activity, thus optimizing the timing of anticancer therapies including anti-angiogenics. 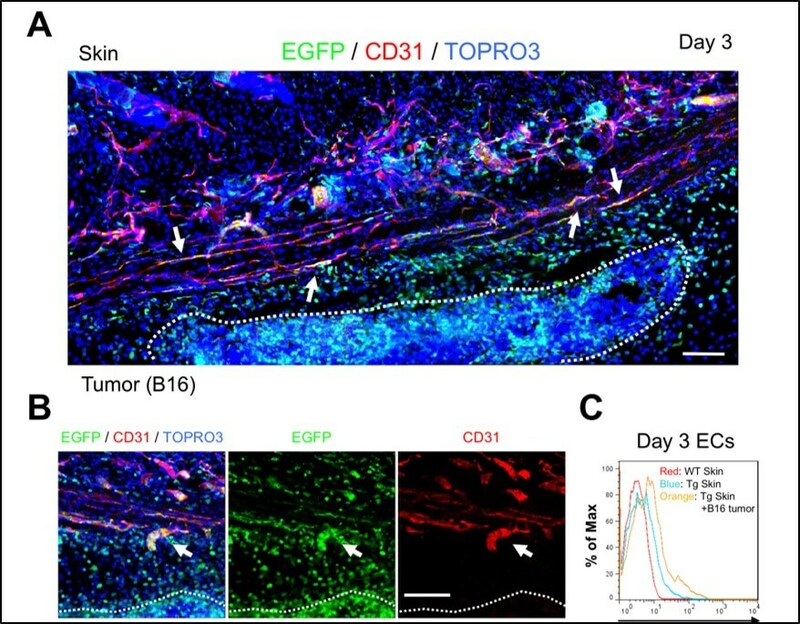 Combination therapy using angiogenesis inhibitors and anticancer drugs can improve drug delivery into tumor tissues and prolong progression-free survival. “Vascular normalization by angiogenesis inhibitors, such as vascular endothelial growth factor (VEGF) signaling inhibitors, is a promising method for improvement of chemotherapy. However, it is unclear how we can recognize the ‘window of opportunity’ for the tumor vascular normalizing period for effective timing of anticancer drug treatment. Therefore, biomarkers delineating this window are essential,” explained Nobuyuki Takakura, MD, PhD, Professor, Department of Signal Transduction, Research Institute for Microbial Diseases, Osaka University, Osaka, Japan. No EGFP signals were observed in normal adult skin vasculature, which was expected as normal skin ECs are dormant. However, after subcutaneous injection of tumor cells, some ECs in and near the tumor shifted to EGFP-positivity. PSF1 promotor activity was also found to correlate well with tumor cell growth. ECs that were high in EGFP expression were larger and had greater intracellular complexity than cells that were EGFP negative. “Our data showed that PSF1-promotor-EGFP mice may be utilized to visualize proliferating ECs by their EGFP expression,” commented Dr. Takakura. “Since CD109 is highly expressed in dormant ECs, we suggest it can be used to detect normalized blood vessels, thus allowing identification of the ‘window of opportunity’ for optimal delivery of chemotherapeutics,” remarked Dr. Takakura. Though angiogenesis therapy is clinically used to suppress tumor growth, unfortunately, monotherapy using anti-angiogenics such as VEGF signaling inhibitors does not effectively suppress tumor growth in patients. Adding an anti-angiogenic drug can boost an anticancer drug’s effectiveness. Basic research indicates that anti-angiogenic therapy allows the blood vessels to return to quiescence and “normalize” so that the anticancer drug can penetrate the tumor more effectively. The article is “Visualization of Proliferative Vascular Endothelial Cells in Tumors in Vivo by Imaging Their Partner of Sld5-1 Promoter Activity,” by Daishi Yamakawa, Weizhen Jia, Hiroyasu Kidoya, Shoko Hosojima, Miku Torigata, Li Zhang, and Nobuyuki Takakura (https://doi.org/10.1016/j.ajpath.2018.01.015). It will appear in The American Journal of Pathology, volume 188, issue 5 (May 2018) published by Elsevier. Full text of this study is available to credentialed journalists upon request; contact Eileen Leahy at +1 732 238 3628 or ajpmedia@elsevier.com. Journalists wishing to interview the authors should contact Nobuyuki Takakura, MD, PhD, at +81 6879 8316 or ntakaku@biken.osaka-u.ac.jp. This research was supported by the Japan Agency for Medical Research and Development (AMED) Projects for Technological Development, Research Center Network for Realization of Regenerative Medicine and for Development of Innovative Research on Cancer Therapeutics, Japan Society for the Promotion of Science (JSPS) Grants-in-Aid for Scientific Research (A) (15H02545), Grant-in-Aid for Young Scientists (B) (JP20631097) and the Takeda Science Foundation.